Does payment in exchange for research participation encourage deception? Payment for research participation can raise ethical concerns and legal issues. But it can also raise scientific problems if it causes participants to lie about their eligibility or other things, like adverse events. 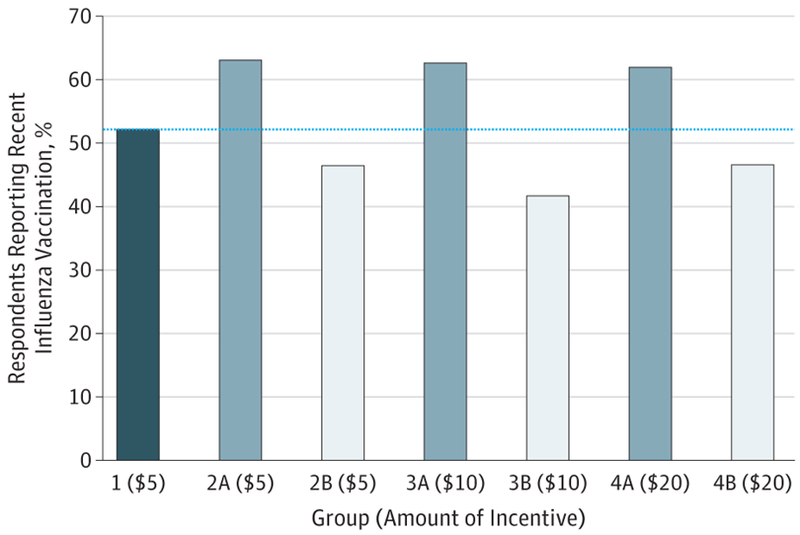 In our new study in JAMA Network Open, my colleagues and I wanted to see whether payment causes deception about study eligibility, and if so, whether more payment results in more deception. We found the answer to the first question was yes – but contrary to what one might expect, payment amount didn’t matter. It’s hard to study if people are lying, for obvious reasons. To get around that problem, we created a randomized controlled survey experiment conducted via GfK KnowledgeNetworks with a nationally representative sample of U.S. adults. We told our control group they were eligible to participate and receive five dollars if they ever had a vaccine in their lifetime (we expected nearly everyone to say yes, and they did). Then, we asked the control group if they had a recent flu shot. Because their eligibility didn’t depend on recent flu vaccination, they had no reason to lie about that. We also told three experimental arms (A groups) they were eligible to participate and receive five dollars, 10 dollars, or 20 dollars respectively if they had a recent flu vaccine and 3 more arms (B groups) they were eligible if they had not had a recent flu vaccine. Then we asked them if they had a recent flu shot. Of course, these groups had an incentive to lie because their payment might depend on it. There was a fair bit of lying going on! The estimated proportion of ineligible individuals who engaged in deception about their eligibility to participate ranged across groups from 10.5% to 22.8%. What was really surprising is how flat the bars are across A and B groups. You might expect lying to increase with payment amount (i.e., more reported vaccination for higher paid A groups/less reported vaccination for higher paid B groups), but we didn’t see that. We also didn’t see any evidence that deception about eligibility impacted responses to subsequent survey questions, one of our secondary aims. The obvious limitation is that we collected our data in the context of a survey, not a clinical trial. Clinical trial payments are often higher than what we offered, and there are other benefits of enrollment that might induce deception. The risks are also greater, of course. We also only tested three payment amounts. The results may have been different if we paid even more, or less, or at finer increments. Despite these limitations, our study is the first to provide insight using a randomized, non-hypothetical design in a nationally representative population. We think these results are an important contribution to the ongoing debate about paying research participants. So what to do about payment-induced deception in research? That’s trickier, but the first step should not be to reduce payment. As Emily Largent and I have argued elsewhere with others, not only can payment be ethical, it can be important as a matter of fairness and adequate recruitment. And lower payment might not actually result in less deception, at least according to our results. Ideally, it’s best to rely on objective enrollment criteria (and for evaluation of adverse events or other things that might permit deception). But we also need to research other solutions.